About half a year ago [John] over at Frank’s Kitchens came to me with an idea for a giant lighting project. He had this 6ft diameter aluminum frame globe rescued from the Philadelphia Theater Company and wanted it to be an interactive display of sorts. After a few discussions we got together and somehow managed to order 800 3 watt LEDs in red, green, blue, and white. We had a system that worked great on paper, and managed to get it built by Valentines day for a big show. It failed miserably and hardly even illuminated the LEDs. I, naturally, took this far too personally and set out for a complete redesign, looking in the direction of digitally addressable LED strips. In addition to building a crazy turbo charged LED array I also spent a lot (a whole lot) of time coding a nice clean fully functioning RGB LED strip controller using an Arduino Pro Mini (5V 16 MHz), the MSGEQ7 audio frequency multiplexer (PDF) , and an IR remote. I plan on using this for other projects so the code can be easily reconfigured to use many different LED strips and a whole slew of IR remotes. The schematic of the globe is here. 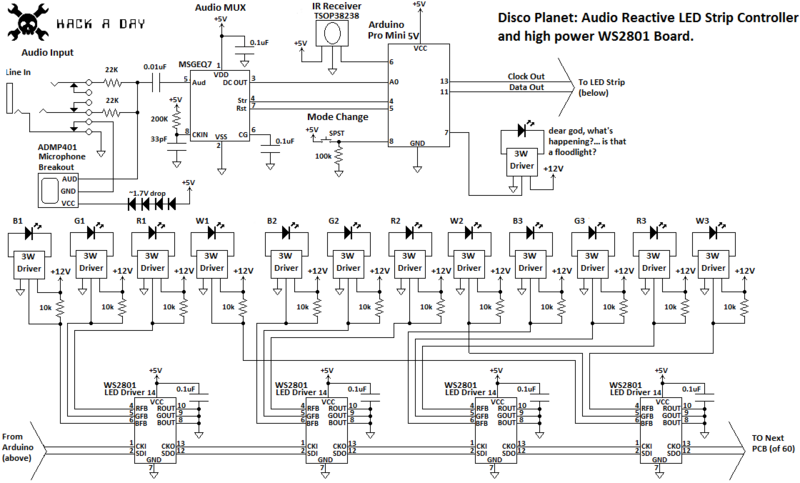 The top half of that schematic be catered to other projects using a variety of pre-built LED strips. The pastebin with code is here, fastSPI_LED and IRRemote here and here. Some code jockeying was required to get IRRemote.h and FastSPI_LED to play nicely together, so check the code comments. 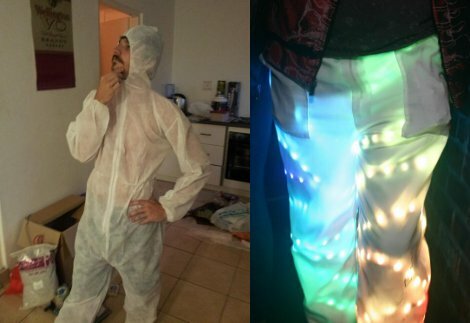 [Rob] has been hard at work designing and building this LED suit which he can wear to parties. He’s got it working, although right now it’s just a pair of pants. It reacts to sound, and has the potential to be controlled from a smartphone via Bluetooth. You’ll find a video description of the build embedded after the break. The planning started off by selecting driver hardware for the LEDs. [Rob] wanted the suit to pulse to the music in the room so he grabbed an MSGEQ7 chip. When connected to a microphone and opamp this chip will output a signal which can be used as a VU meter. He built the hardware into an Arduino shield, then got to work on the LED driver board. He’s using LED strips, but they’re not individually addressable. Instead he cut loops which wrap around the wearer’s legs. Each loop connects the pins of a TLC5947 LED driver chip which sinks a constant current and offers PWM abilities. He’s using PNP transistors on the high side. For anyone that’s ever worked in a Tyvek suit before you’ll know they don’t breathe. Sweat will literally be pouring off of you. And we’d bet that’s what cause the short that burned the back of [Rob’s] leg at a recent party. Then again, your light-up pimp coats are going to be hot to wear too. If you’ve never been to a chiptune show – yes, they exist – you’ve noticed the awesome visuals behind the performers that are usually displayed with a glitching NES. If it’s a really good show, that 8-bit visualization will be in sync with the music and may actually serve as a lo-fi spectrum analyzer. [Andy] came up with his own visualization system for a Sega Genesis or Megadrive. With 16 bits behind his build, we’ll say if far surpasses the lowly NES. For his visualization, [Andy] feeds audio into an ATMega328 and the ever-popular MSGEQ7 seven-band graphic equalizer IC. The output from the EQ goes straight to the second controller input of a Sega Nomad [Andy] had lying around that is running a custom ROM for his show. The ROM is programmed in tandem with the microcontroller project to serve as a spectrum analyzer for his shows. You can check out [Andy]’s visualization with the chiptunes of Danimal Cannon after the break. We would prefer a demo featuring An0vA and the code for the microcontroller, but it’s still a very nice demo indeed. [El Artis] just finished building an audio spectrum analyzer that uses a character LCD. The uses an Arduino to drive the display, but unlike other meters that use the microcontroller for analysis, [El Artis] is using a discrete IC for that task. 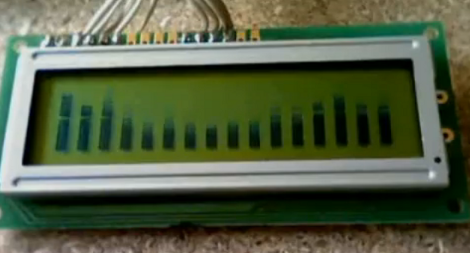 This project uses the MSGEQ7 graphic equilizer display filter chip to grab frequency data from the audio source. The chip connects to your microcontroller of choice using two digital pins and one analog pin. [El Artis] points us to [J Skoba’s] post about how to use it with an Arduino, then adds his own custom character routines for an HD44780 display. You’ll notice that there are sixteen bars in the image above, which conflicts with the 7 outputs the chip offers. [El Artis] averages neighboring values in order to add the extra outputs. Don’t miss the demo video after the break. If you’re looking to use this part in one of your projects, we noticed they’re a little hard to find (octopart doesn’t return any suppliers) but SparkFun has them.